Note that you must have a full version of Kontakt (version 5.6.0 or later) to use the Kontakt files within this sample library. 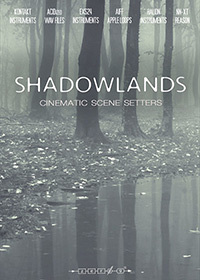 Shadowlands - Cinematic Scene Setters is an enormous 16 GB sound library containing 50 cinematic construction kits together with textures and atmospheres, movement FX, cinematic grooves, rhythm loops and vocal FX. The 50 construction kits present a full musical / sound design piece which is then broken up into its constituent parts (such as soundscapes, pads, atmospheres, FX, strings, guitars, percussion) so that you can use them any way you like. Fantasy, adventure, mystery, sci-fi, thriller, horror and action genres are all included in this vast library. Each construction kit is a full length standalone musical composition in its own right. Shadowlands is the ideal companion for any professional sound designer or composer for film, TV or video games and with over 16 gigabytes of material you should be able to find something that suits your project. 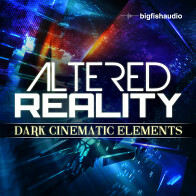 As well as pristine 24bit Acidized Wav Files and AIFF Apple loops this colossal library also contains over 650 instruments in Kontakt, EXS24, HALion and NN-XT format so that you can load the sounds straight into your favourite composition software. All the samples in this library have been pre-cleared and are 100% original and royalty-free. The Following End User License Agreement is included with Shadowlands. This License is only valid for the individual who has purchased an unopened, new and lawfully made copy of Shadowlands from a dealer or distributor authorized by Big Fish Audio.